Promoting and Preserving the Highest Quality of Standards Among MROs and Their Teams. Click on the appropriate button below for more detailed information on the certification process. A Medical Review Officer (MRO) is a licensed physician who is responsible for receiving and reviewing laboratory results generated by an employer's drug testing program and evaluating medical explanations for non-negative drug test results. The MRO acts as an independent and impartial "gatekeeper" and advocate for the accuracy and integrity of the drug testing process. The MRO provides quality assurance review of the drug testing process for the specimens under his or her purview, determines if there is a legitimate medical explanation for laboratory confirmed positive, adulterated, substituted and invalid drug test results, and ensures the timely reporting of test results and other information to employers and protects the confidentiality of the drug testing information. Reporting the verified result to the federal agency. Review the results of federal agency blind samples and perform the initial investigation into discrepant results. Request additional testing (as allowed) to help in the determination of a final result for a donor specimen. have completed approved MRO retraining in the 5 years preceding the examination (training used previously to fulfill the requirements to get certified/recertified as an MRO cannot be reused). The retraining requirement may be fulfilled by either the MROCC "At Home" Self-Study CME activity or an approved onsite MRO training course. MRO Certification and Recertification examinations may be taken online or onsite. Onsite exams are administered immediately following MRO training courses offered by ACOEM and AOCOPM. Course registration is separate and is completed through the course sponsor. $565 25 Hour MROCC Self-Study CME Activity and ONSITE Recertification Examination ($170 for 25 Hours of CME; $395 for ONSITE Recertification Exam. Cost of MRO Manual is separate and purchased through OEM Press). $665 25 Hour MROCC Self-Study CME Activity and ONLINE Recertification Examination ($170 for 25 Hours of CME; $495 for ONLINE Recertification Exam. Cost of MRO Manual is separate and purchased through OEM Press). MROCC certification is DOT and SAMHSA recognized and approved. The examinations are based on 49 Code of Federal Regulations (CFR Part 40) and the MRO Competencies Document. As mandated by the Department of Transportation, MRO certification is valid for five years, at which time recertification is required to remain within DOT compliance and in the directory of currently-certified MROs. State-of-the-art psychometric procedures are employed for scoring and the determination of the minimum passing level. Scores are determined and reported based upon the total number of items answered correctly. There is no penalty for guessing. Passing scores are not determined on the basis of subcategory scores. Prior to taking an MROCC examination, it is the responsibility of the registrant to have read and to understand MROCC's policies on cheating and certificate revocation. Examination results are given immediately upon submission. If you receive a pass result, you can expect to receive an email from MROCC in approximately 7 days with instructions on accessing your official verification and ordering a professionally printed certificate. If you do not pass the examination and have not utilized your retest(s), you will receive an email with information on the retest within 48 hours of receiving your examination results. Examination results are sent out by email within 4-6 weeks of taking the examination. If you pass the examination, an official verification of certification will be available at that time by logging into your MROCC record. If you do not pass the examination and have not utilized your retest(s), you will receive an email with information on the retest within 48 hours of receiving your examination results. If you completed the 25 Hour Self-Study CME activity, the CME certificate will be available approximately 4 weeks after completion of the examination. Once the exam is completed, CME needs to be processed through the American College of Preventive Medicine (ACPM). Once it has been processed, MROCC will send an email with instructions on accessing the CME Certificate. If you need confirmation of your CME submission prior to that, please send an email to mrocc@mrocc.org requesting verification of submission. Maintenance of Certification (MOC) credits for the American Board of Preventive Medicine (ABPM) are forwarded directly to ABPM within 4 weeks of completing the examination. If you need confirmation of your MOC credit submission prior to that, please send an email to mrocc@mrocc.org requesting verification of submission. While we hope that everyone who takes the examination will pass it; we know realistically that there are many factors which can interfere with performance. In recognition of these possible complicating factors, the MROCC Board has adopted a policy on retests. The retest policy permits the examination to be taken one additional time for free within 12 months of completion of the MRO course. 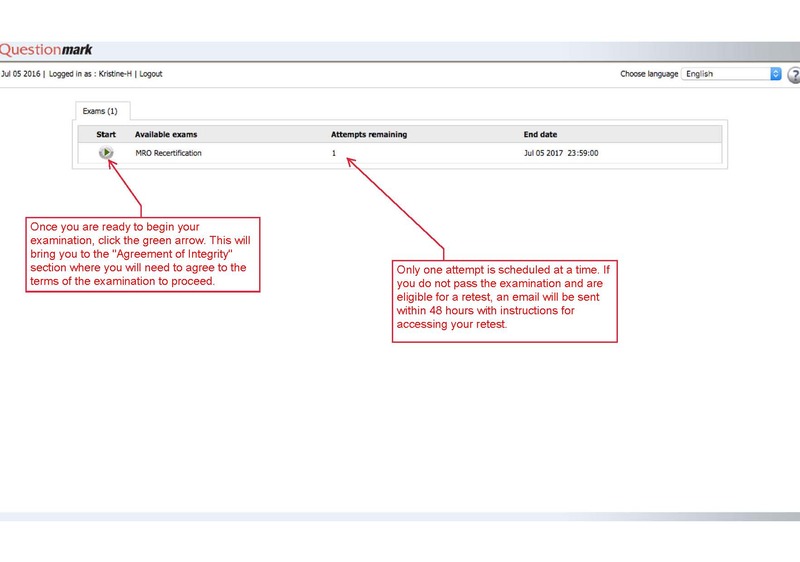 An email with information on logging into the retest is sent out within 48 hours of the failure notice. If you do not pass the retest, a new application and full examination fee will be required before attempting the examination again. Completion of a new MRO course will be necessary if it has been more than 12 months since completion of the course. 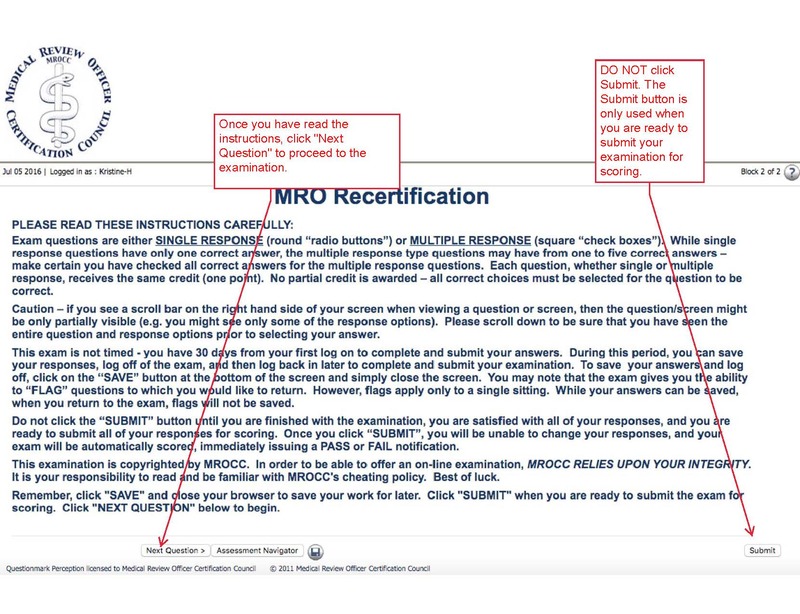 If you have already completed your retest opportunity, please log into your record at https://www.mrocc.org/app_choices.cfm and select "I have exhausted my retest attempts, I need to reapply" to complete your application and pay the examination fee. The retest policy permits the examination to be taken two additional times for free within a 12 month period from the date of registration for recertification. An email with information on logging into the retest is sent out within 48 hours of the failure notice. If after two retests, you have not passed the recertification examination, a new application and full examination fee will be required before attempting the examination again. If you have already completed your retest opportunities, please log into your record at https://www.mrocc.org/login.cfm and select "Recertify Now" to complete your application and pay the examination fee. Weaknesses and strengths within each of the MRO competencies are included as part of your examination results. Examinees who do not pass the examination, should review these areas to determine where to focus their studying prior to taking the retest. 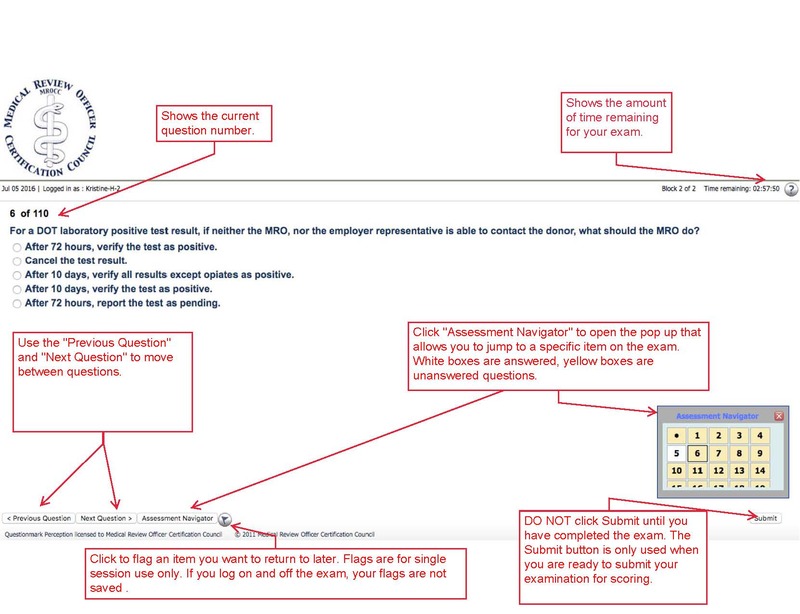 If you are taking the examination online, a quick review of the screenshots below may help to navigate the examination a little more easily. Click on an image below to enlarge it. Once MROCC has processed your registration, a confirmation email will be sent within 24-48 hours that includes instructions and logon information for online examinees. Those taking the onsite paper-based examination will receive an email confirming the date and location of the examination. A reminder email with the examination room will be sent approximately 4-5 days before the examination. Upon submission of your online examination, results are available immediately. Onsite paper-based examinees can expect a results notification email within 4-6 weeks of the examination. If the examination is not passed and you have retest opportunities remaining, an email will be sent within 48 hours allowing access to your retest. Passing results for the online examination are processed by MROCC staff weekly and examinees can expect an email allowing access to their official verification and certificate order within 7-10 days of examination submission. For those who completed the 25 Hour Self-Study CME activity, CME will be sent for processing upon completion of your examination. An email will be sent once your CME certificate is prepared and available on the website (appr 4 weeks). If you need confirmation of your CME submission prior to that, please send an email to mrocc@mrocc.org requesting verification of submission. To begin the registration process, please select from the choices below. WHAT IS AN MRO TEAM MEMBER? The MRO can be assisted by one or more staff. An MRO team member performs administrative functions and does not perform any portion of the interview between the MRO and donor. The administrative functions typically include receipt and sorting of test forms, presenting non-negative and fatally flawed files to the MRO for review, and distribution of reports to clients. Some MRO team members also call donors, confirm their identity, and then transfer the calls to the MRO. Some MRO team members are also involved in the corroboration of medical explanations that donors may present to the MRO. An MRO team member should be detail-oriented, well organized, and reliable. Under the U.S. Department of Transportation (DOT) drug and alcohol testing procedures, the MRO must supervise the MRO team member. This supervision must include personal oversight of that team member's work; personal involvement in evaluating, hiring, and firing the team member, line authority over the team member for decisions, direction, and control; and regular contact and oversight concerning drug testing program matters. The MRO's supervision and control cannot be superseded by or delegated to anyone else with respect to test result review and other functions performed by the MRO team member. This three-year certification -- awarded upon successful completion of approved training and passing of the MRO Team Member online examination -- acknowledges competency in those practical skills the MRO Team Member applies in fulfilling his or her professional responsibilities within the workplace drug testing arena. Within both Regulated and Non-Regulated testing programs, the MRO Team Member must understand and be confident in his or her role and that of the physician MRO -- maintaining a clear and thorough comprehension of what the team member can and cannot do; defining the issues that arise during the medical review process and the best courses of action to tackle these issues; providing services to the physician MRO that meets standards of professionalism, accountability, and ethical behavior; and implementing practical application of industry standards and procedures. An MROCC-Certified MRO Team Member provides assurance to the MRO, the employer, and the donor duties are performed in a consistent and professional manner, ensuring integrity and confidentiality throughout the entire drug testing process. Training Waiver: Individuals who have a minimum of three year's experience as an MRO Team Member may waive the training course requirement with a letter of recommendation from a currently certified MRO. The letter must be from an MRO who has worked with the team member for a minimum of one year, and has knowledge of his or her competency as an MRO Team Member. Documentation of MRO Assistant Training course must be submitted at the time of registration. Certificate of course completion or registration confirmation/receipt from the course provider is acceptable. Read MRO Team Manual: MROCC'S Guide for MROs and MRO Team Members available from OEM Press, and complete/submit the Self-Assessment tool with their registration. 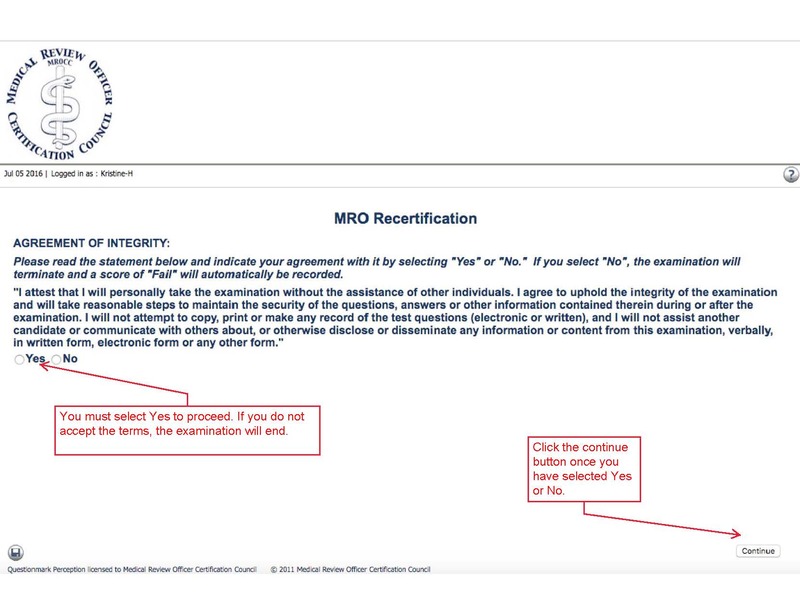 Completed Self-Assessment tool or documentation of approved MRO Assistant Training course must be submitted at the time of registration, along with the letter of recommendation from the supervising MRO. 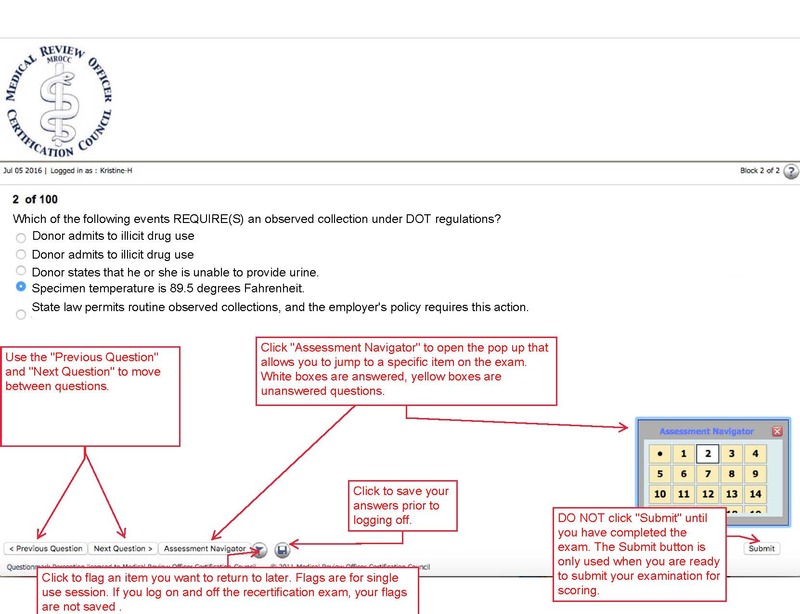 The online exam -- offered to individuals who have completed appropriate MRO Assistant Training or have at least three years of confirmed experience -- consists of multiple choice items, distributed by content area according to the examination blueprint, and intermingles recall (recognition), simple interpretation (analysis), and problem solving (evaluation) type questions. Examinees will have 30 days from their first log on to complete the examination. Refund requests for online exams cannot be honored once the exam has been scheduled, regardless of whether or not it has been accessed. Please understand this in advance of registering. You will receive your online examination results immediately upon submission. If you receive a pass result, you can expect to receive an email from MROCC in approximately 7 days with instructions for accessing your official verification and ordering a professionally-printed certificate once your results are uploaded into the MROCC system. If you do not receive a passing result, you can expect to receive an email within 24 hours that includes a link to the examination retest form. Once MROCC has processed your registration, a confirmation email will be sent within 24-48 hours that includes instructions and logon information for your examination. Upon submission of your online examination, results are available immediately. If the examination was not passed, a link for a retest order form will be included in your result notification email. Passing results are processed by MROCC staff within 7-10 days of submission and an email will be sent allowing access to your official verification and certificate orders at that time.